This Disney Trip Report Index tells you a bit about the planning of this trip, as well as some info about my family and me (the Cast Members!) In short you have me, Michelle; Steve, my husband, and Liam, my son. It also, of course, has the full list of days for Hibiscus & Holly At The Poly 2017. We checked-in to the hotel and headed to our room. We didn’t do much exploring of the hotel itself as we were all tired from working that day, and even had in-room dining to save worrying about booking a table for dinner. Now that Liam is over 18, and officially an adult, we couldn’t book a Compact Family Room, as that is only for children up to 12 years old; and we didn’t want to pay for two Interconnecting Family Rooms, so we opted for the Triple Guest Room, which would have three single beds. We booked direct on the Hilton website, and paid £164 for the night – a buffet breakfast was included in the price as we are Hilton Honors Members. Our room was HUGE! 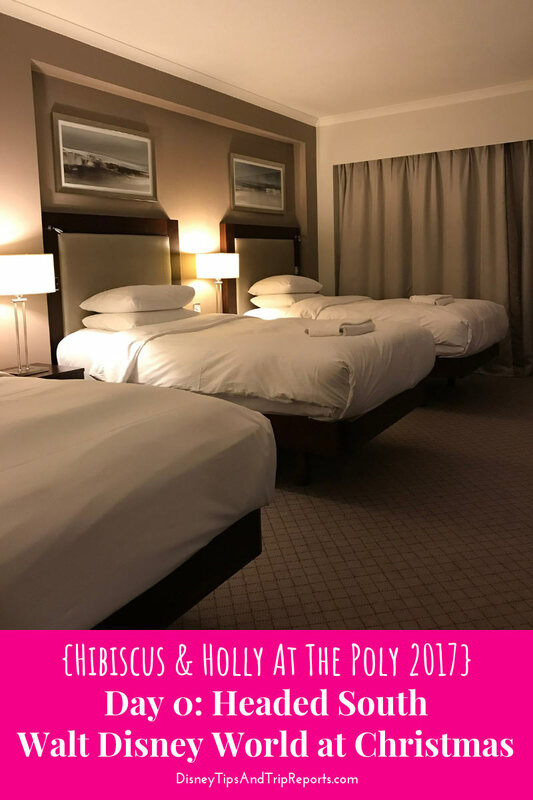 I’m not sure if it was still described as a triple room, as it had a double bed, and two singles beds/twin beds, but regardless, it was definitely one of the biggest hotel rooms we’ve ever stayed in as a family! There was a little bit of a corridor with a recessed area for the wardrobe (huge), and the bathroom was just opposite. Again, huge! Hotel bathrooms can be a bit pokey can’t they? This was anything but… I couldn’t even get the whole room in one photo! Additionally, there was a desk and chair with a mirror above it, a dresser/cabinet with a flat-screen TV on top, and a smaller table with two chairs. There were also the usual hotel room amenities like safe, mini-bar, iron/ironing board, hairdryer etc. As well as Wi-Fi (fees apply), on-demand movies, air conditioning and 24-hour room service. I think the only thing that let the room down was the bathroom – despite it size, it felt dated and well used (which I know it will be); but for the price point I know I expect that little bit more. One of the tiles had a chunk missing/chipped off, and we actually placed something on top of it so that we wouldn’t catch/cut our feet/toes on it. There was a bath tub and shower, toilet, bidet (Liam asked what that was as had never seen one before! ), and sink/vanity. The complimentary toiletries were a nice selection. After settling in, we ordered room service, then Liam and Steve nipped to Costa to buy some drinks for us. Just a heads up – the Costa closed early – by the time we finished our dinner at about 8.30 it was shut. This was mildly annoying as we had planned to get a slice of cake for dessert! We didn’t have to wait too long for room service which was good, but unfortunately the food was more warm than hot, which is one of my bug bears! But you know when you just want to have your dinner and go to bed – that was at this point – so didn’t bother to complain. The food was nothing to write home about – standard hotel restaurant food. The cheese plates were exceptionally sorry for themselves though. The cheese was cut rather thin, and you could see (and taste) that it had been out for a while. There were hardly any crackers either. You know when you’re really looking forward to a particular plate of food and it ends up being really lacking? That was this cheese plate sadly – a poor show all round. I already mentioned that Costa was now closed – found out because Steve had nipped up there to get us some speciality coffees and some cake. Oh well. It’s likely that we spent the rest of the evening on our various mobile devices or watching whatever rubbish on the telly, before hitting the hay for our flight to Orlando the next morning! I did a fair bit of Instagram Stories, and Lives on this particular trip, and I’m going to combine them all into one video of the whole holiday. It may take a while, but when I do, I’ll put it up on YouTube for all to see!